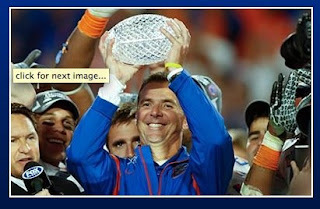 For the Love of Pete...: It's Great... To Be... A Florida Gator! 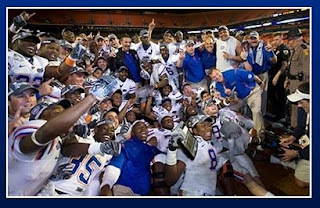 It's Great... To Be... A Florida Gator! Last Football post I swear. The game? Well it was a nail biter until the 4th quarter. Me and my nervous tummy prefer early blowouts. But alls well that ends well. So happy for our gators!!! They brought it!!!! YIPPPEEEE!! For you!! YAY! Texas Rocks! Wait, we were talking about Florida, right? Sorry, I got confused. I saw blue and white and thought silver -- Cowboys! LOL! The Gators rocked it out again!! I could get used to doing this every two years... hell, every year!! 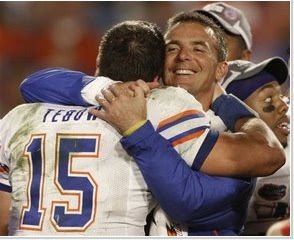 Glad Tebow is coming back next year - great pix of him BTW... what great biceps! !